Hit the ground running in the huge Quebec vacation rental market with these two, well-established and very lucrative rental chalets. Located just 6km apart in the highly desirable Laurentian mountains, both are just 30 minutes to world-class Mont Tremblant and Mont Blanc ski hills, and perfectly situated to attract the substantial Ottawa and Montreal rental clienteles. Successfully operating since 2005, this is a turnkey business operating on a proven business model that can show increased sales year after year. With an average annual occupancy rate of 53%, there is massive income growth potential with little input. Plus, enjoy the chalet for yourself when it's not booked as an added benefit. Summer high season is approaching quickly... Buy now to capitalize on high earnings coming up. Each chalet sites on nearly 1 acre of land with private waterfront, and is fully equipped with all furnishings, supplies, equipment, hot tub, pedalboat and canoe, propane barbecues, and more. Visit http://www.qccottages.com/for-sale.html for more information. 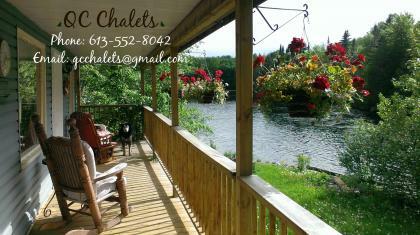 I've been successfully building and running this cottage rental business on my own since 2005. Over the years, I have worked to make these businesses as automated and hassle-free as possible. A local network of friends, neighbours, businesses, and contractors who are familiar with the properties and rental operation enables me to be anywhere in the world while always having the right skills and expertise available for any situation. All I do now is answer emails and cash cheques. You can continue to use this network, or reduce your costs by being more hands on. The choice is yours. Both methods generate positive cash flow! In 2016, the occupancy rate at Riverfalls Cottage was just 52.8% (193/365 nights). At Cottage Blue, the occupancy rate in 2016 was 56.4% (206/365 nights). Still, each cottage generated considerable positive cash flow after all expenses, with minimal input from me. This indicates massive growth potential for someone with the time and inclination to further develop the clientele base. 1. In fiscal 2016 at 53% avg. occupancy, combined gross revenues were $65k with a net income of $44.5k (68%) after fixed and variable operating expenses*. 2. As an example of upside potential, increasing occupancy to 70% would grow revenue to approximately $86k and since fixed costs are covered, only variable costs would increase (mostly incremental cleaning, around $6k). Income would be approximately $59k not including financing costs. 3. Assuming mortgage financing at 3.25% (TD rate as at December 2017) with 25% down and a 3-year fixed term on a mortgage, debt servicing - including a 3% cost provision for the down payment - would total approximately $1.9k / month ($23k/year). This scenario results in a fully loaded cost base (including all financing costs) of $50k, resulting in an income of $36k/year. This does not include the upside of any capital appreciation related to the increase in the value of the properties and the added value related to personal use of the properties. Although I continue to enjoy managing the cottages, speaking with the various clients who enjoy making memories there, and the easy and steady income it provides me with, I feel ready to move on to other projects and be challenged by new ventures. Having recently moved my life to the west coast, I'd like to use the equity I've built up to invest in property here that I can take a more involved role with and see and enjoy close to me. The time has come to pass these great properties onto someone else who will enjoy them and all they have to offer. Could it be you?